Here’s to you, أسامة بن محمد بن عوض بن لادن – Usāmah bin Muḥammad bin ‘Awaḍ bin Lādin. You were born into wealth and happiness, married your first wife at seventeen and have fathered at least a dozen happy kids, most of whom have never seen you. You supported the Arsenal football club as a young man. You’ve grown one of the most recognizable beards in all the world. In college, you became a leader of one of those wild campus protest groups – a paramilitary offshoot of the Muslim Brotherhood, and went on a free ride to Afghanistan where you ambushed and killed Soviet soldiers in the name of jihad. In 1984, you took the initiative and partnered with an old teacher to form Maktab al-Khadamat to help fund the fight in Afghanistan. 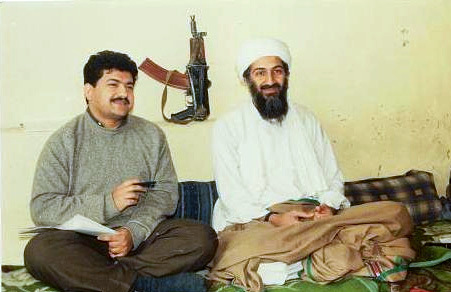 But you left that group in 1988 and started a new group with more activities and trips abroad – al-Qaeda. It is not like you are all bad, I’m sure. Sure King Fahd exiled you to Sudan in 1990 for your outspoken opposition to the USA. Even your own family cut off your income in 1994, but that’s just because they didn’t understand you. Over the past twenty-two years, you have encouraged your followers to bomb the World Trade Center (1993), planned to assassinate the President on a visit to the Philippines (1996), succeeded in bombing of two US embassies in Africa (1998), and attacking an American warship (2000). But no one could have seen the choice you made that catapulted you to the spotlight. You turned civilian aircraft, carrying innocent victims into your weapons and changed the face of terrorism forever. Although everyone in the CIA and foreign intelligence services knew you were planning to hijack planes, no one expected you to use them as weapons. Yes, Usāmah, you are truly a man apart. While there are many terrorists in the world, only you could come up with something so absolutely beyond human reason. So, here’s to you, Usāmah bin Muḥammad bin ‘Awaḍ bin Lādin, wherever you are. You did exactly what you said you would. You provoked the USA into fighting a pan-national war to find you. You created terror in the hearts of Americans. Thousands of your followers have died in the wars that followed; and thousands more will continue to die until we find you. Kudos to you. May hope never be extinguished by people like you – people who devote their lives to destruction, death and terror. May the hope of freedom and peace always shine brighter than the darkness you create. May justice find you, in whatever dark hole you’re hiding in.